Sometimes when I’m trying to fall asleep in a thunderstorm I get very paranoid that the ceiling is going to cave in on me. I’ll start to drift off but then I’ll here a creak or a pop that is surely the sound of a joist about to break. I wonder if learning more about home construction would make me more or less paranoid. Well that IS a splat of sorts… so it still fits the weeks theme. Sometimes I worry about that, but I figure that considering how many houses there are we would be constantly hearing about these sort of things happening if they were anything but a rare occurrence. Pretty much the only time you hear about roofs collapsing is with heavy snow. hmmm is biff even under those blankets? they aren’t shaped quite like if somebody were beneath them (the parts you can see, obviously you can’t see through the compost). My kitchen ceiling fell down yesterday. There had been a minor leak (which the apartment owners simply tried patching over) that dripped down into the cabinets… Turns out our neighbor’s shower practically drains into our kitchen ceiling. Lots of rot, lots of black colored mold. Only someone with a microscope can tell if it’s Black Mold *horror music*. Chances are, if you don’t live in a slum, your ceiling isn’t going to fall on you. More paranoid, definitely more paranoid. @baughbe: Indeed. As a Civil Engineering student I assure you, definitely more paranoid. SilentDragon: You didn’t notice the limp browhair, did you? And I also noticed the flat sheet, but cut Chris some slack for knowing how hard it is to draw 3-D onto flat surfaces. Mewthicus: Yes! Good call on the subtheme. One could argue that bringing a cup of coffee into an art museum counts as bad planning. 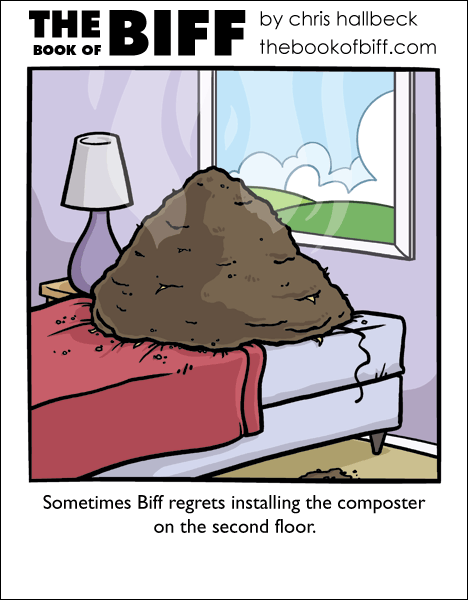 Todays unfortunate event for Biff could have been a lot worse, you all know. Given the nature of Biff’s world, it is entirely possible for there to have been elephants living upstairs. Biff clearly didn’t build to Code. If he had, the pile of compost large enough to break through would have covered his *entire* bed! so you probably wouldn’t want to read Levy and Salvadori’s book Why Buildings Fall Down?